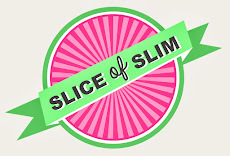 Slice Of Slim: Food For Thought : A little bit of SIMPLE START Organisation! Food For Thought : A little bit of SIMPLE START Organisation! As with any new venture-whether it's getting fit, a new job or a healthy eating plan, it's really important to make things as easy for yourself as you can in order to stick to your new routines. I'm not an organised person naturally. I have to work really hard at keeping my house tidy and being methodical. So, when I saw the list of Filling & Healthy foods I could eat on Simple Start, I decided to take some positive action! By allocating a small part of my kitchen store cupboard to Simple Start and making a label using low-tack tape, I can then pop all the foods I am eating on a regular basis in one space. This is so much easier than constantly having to check the list and search for the right foods. I do exactly the same with a plastic box in the fridge, keeping all my chilled ingredients in one place. So if I come home hungry and want to make a quick meal, I don't have to start searching in the depths of my fridge for appropriate foods! A smart start to Simple Start!